When you put it all together, EVERYTHING CONNECTS. The constant cascade of new technologies and social changes is creating a more empowered population. Workforces are increasingly dispersed, demanding of self-expression, and quite possibly disengaged. Within this topsy-turvy context, leaders must spark creativity, drive innovation, and ensure sustainability. What are the remedies? The newest problems of the world find solutions in the oldest and time-less practices such as mindfulness, authenticity, and perseverance--because Everything Connects. Everything Connects is a kaleidoscopic view of the way humans--by being able to think out of the box--have been able to achieve greatness for themselves, their organizations, and the world at large. It is your step-by-step guide for working with yourself and others--for meaningful success. Part philosophy, part business, and part history, Everything Connects offers the wisdom of 2,500-year-old Eastern philosophies and the interconnected insights of Leonardo da Vinci. Couple that with Fortune 100 corporate cross pollination for creativity and startup thinking for how to adapt with ease, and you'll quickly discover that Everything Connects. This isn't just a quick fix for your next financial quarter; this is how you succeed in the long run. It is a systemization of the best practices of spirituality and entrepreneurship--loaded with knowledge, humor, and humanity. 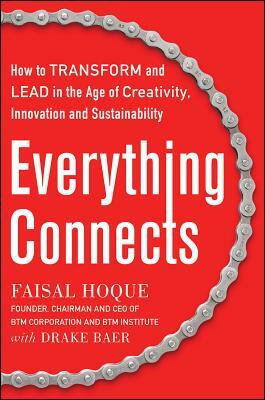 Faisal Hoque is the founder of MiND2MiND Exchange, B2B ForeSight, and other companies. He is the author of several books and regularly contributes to Fast Company and Huffington Post. Formerly of GE and other global brands, Hoque's work has also appeared in The Wall Street Journal, BusinessWeek, and Forbes. The editors of Ziff-Davis Enterprise named him one of the Top 100 Most Influential People in Technology. Follow him @faisal_hoque or visit faisalhoque.com. Drake Baer is a contributing writer for Fast Company, where he covers the intersection of psychology and work. Though he now interviews the foremost minds in business for a living, he's spent years exploring the world.